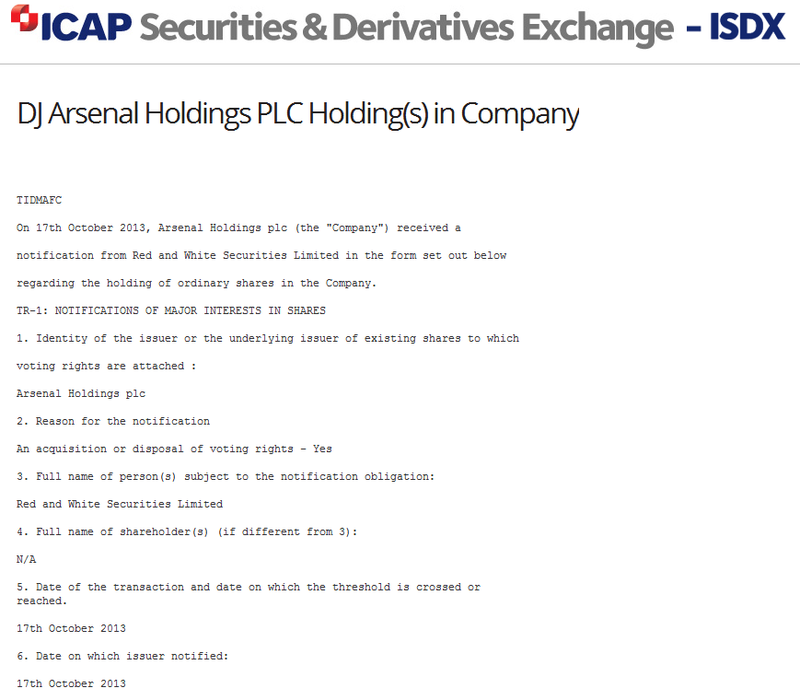 Arsenal Shares – Usmanov Goes Over 30%! Just a brief post as Alisher Usmanov and Farhad Moshiri’s jointly owned investment vehicle R&W Holdings have announced that they’ve taken their Arsenal shareholding over the symbolic 30 per cent mark today with the purchase of 6 shares. There’s no update on Arsenal.com as yet, though these normally appear on a Friday, so if the paperwork is all done and dusted then we should see that tomorrow. I suspect, though, that given the timing of this to coincide with the AGM, R&W have decided to announce today and complete the paperwork later. The announcement was made through ISDX, and was necessary as it breaches a recognised threshold. This takes the R&W total from 18,665 to 18,671 shares – 18,666 was needed for 30 per cent. This is the first share purchase notified by R&W since May. Purchases earlier this year that had kept R&W on 29-point-something were only announced through Arsenal.com updates, not on ISDX. There have been no trades reported on the ISDX exchange since a single share on October 9, so it appears R&W have continued their habit of purchasing privately off market. This means there is no requirement for anyone to know the terms of the deal, though R&W have previously stated that they never buy at higher than £14,000 per share. The prevailing price recently has been around £15,000. Stan Kroenke’s KSE own 66.83 per cent of Arsenal, a total of 41,583 shares. The remaining three per cent of shares are split between about 300 shareholders, the largest of whom has 120 shares, with the AST’s Fanshare scheme currently holding 104. In legal terms, Stan still holds all the cards. His 66 per cent is enough for complete day to day control, and appointing whoever he likes to the Board – in fact just this morning he re-appointed himself, despite some at the AGM voting against! If you’re new here, I’ve done various Usmanov/share posts before, so if you search for ‘angryofislington Usmanov Q&A’ you’ll find all of them pretty easily. ← Who Goes To Arsenal’s AGM – And Why? Sooner the Russian takes over the better.The yank is not interested in Football. The Russian wants to be part of a successful club and the Kudos that goes with it. Let him have it, he would be good for Arsenal. At least Usmanov can’t get any control, we are finally beginning to see light at the end f the tunnel that was the financial restraints due to the stadium build. We will comfortably be a self sustaining club very soon. There have been lessons learnt along the way but overall, congratulations to the Arsenal board for guiding us here. If only Stuart could look a couple years into the future. Wenger has replaced the ‘light at the end of the tunnel’ with a cheap bic lighter as a replacement. There were no LEDs available on the market, you see. wish i could like this comment! I wish I could laugh at Wenger’s continued lack of competence. If only we had money to address the flaws in our squad.. Oh, wait.